The Left Menu is the primary navigation of the site. As mentioned previously, consistency across a programme will improve usability and accessibility. However, module leaders should use the Left Menu to reflect the structure of their taught programme. This saves students time figuring out where to find materials and redirects their efforts to engage with the course content. Assessments – information about and electronic submission points (if online submission is being used). Alternatively, you could use the Left Menu to structure the site by topic or week. This is particularly useful where you have lectures, labs or seminars that are intrinsically linked and dependent on each other. Use menu headings and divider lines to break your Left Menu up into logical sections. Content in a site should be divided up into subsections, however this can introduce an additional layer of folder navigation if your first level of navigation, the Left Menu, has too few links. Left Menu Subheaders and Dividers allow you to structure the menu with a larger number of links, to reduce the need to create additional layers of navigation with folders. 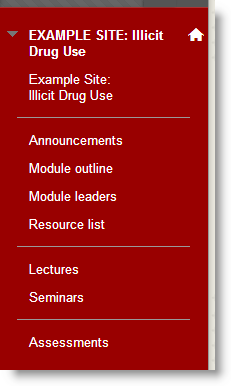 This example from a Programme Site illustrates how the Left Menu has enabled more content to be accessed with a single click by using menu subheaders and dividers. If the subheaders were not used, there would be fewer entries on the menu resulting in a folder structure that was deeper and more difficult to navigate. The menu is more than just a list of links. With the use of subheaders the whole site content is outlined. The subheader text is also written with the student in mind, for example ‘Your programme’, ‘Academic development’ and ‘Contacting staff’ relate to the sorts of information and guidance that students would be seeking within this site.